Knob CreekI’ve had this 50ml bottle of Knob Creek sitting on my desk for some time. 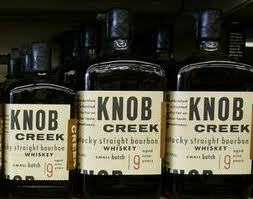 I’ve had this 50ml bottle of Knob Creek sitting on my desk for some time. I believe I purchased it to take to a leadership course that had an “adventure” planned for the great outdoors. Well, being that the temperatures were hovering around freezing, I thought I might need a little something by the campfire that night, hence the small bottle (travels easy). As far as tasting notes, I do love bourbon, and this is a worthy contender in the “above-average” group of bourbons from Kentucky. It is aged 9 years which is on the high side of good bourbons. Many good bourbons can be brought to market after seven evidently. I particularly like the packaging also. I’m not usually a fan of more than two fonts on anything but somehow it works on this “aged” paper. As far as color, its a nice medium amber. As far as the nose goes, I picked up vanilla and a slight sweetness that reminded me of a charcoal barrel. After adding a touch of water, the sweeter smells moved to the rear so I didn’t waste anymore time on that. As far as the taste, a very nice honey taste with vanilla notes. Maybe toffee, I’ve got to have some toffee again to be sure. In short, I did like this bourbon and wouldn’t hesitate to recommend it to anyone.